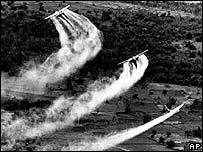 • 1961 to 1972: U.S. military sprays some 20 million gallons of Agent Orange and other herbicides across Vietnam and some parts of Laos under Operation Ranch Hand. • 1968-69: U.S. Military uses Agent Orange in Korean DMZ, exposing an estimated 12,000 veterans. • Early 1970s: Veterans begin complaining of strange skin lesions called chloracne and other health problems as well as a spike in birth defects in their children. VA requires proof of exposure from anyone filing a claim for benefits. • 1982: VA decides that Vietnam veterans with chloracne are presumed to have been exposed to Agent Orange. • 1984: Congress orders VA to assemble a scientific committee to draft regulations to provide medical care and benefits to Vietnam veterans who can prove they were exposed to Agent Orange. The VA’s committee says only veterans with chloracne should qualify. • 1986: National Veterans Legal Services Program files suit challenging VA’s “chloracne only” rule. It wins the case in the U.S. District Court for the Northern District of California. • 1990: U.S. Centers for Disease Control and Prevention issues its Vietnam Experience Study showing veterans who served in Vietnam War have a far higher rate of non-Hodgkin’s lymphoma than veterans from the same era who didn’t serve in and around Vietnam. The Vietnam Experience Study also concludes that highest incidence of non-Hodgkin’s lymphoma was experienced by military personnel who served on ships off the coast of Vietnam. • 1991: Congress Passes the Agent Orange Act of 1991 stipulating that any veteran who served in Vietnam from Jan. 9, 1962 to May 7, 1975, is presumed to have been exposed to Agent Orange and automatically qualifies for disability rating and medical care for a list of specified diseases. • February 2002: Under the direction of the Bush Administration, VA changes its rules to require Navy and Marine veterans who served on ships to prove they also had “boots on ground” in Vietnam in order to qualify for Agent Orange benefits. • 2002: Alarmed at higher than normal rates of cancer in its sailors who served in Vietnam, the Royal Australian Navy publishes study showing distilling water on Navy ships magnifies the concentration of dioxin – a key toxic ingredient in Agent Orange. • 2004: VA denies an Agent Orange claim for Jonathan Haas, a retired Naval commander who served on an ammunition tender in Vietnam who has Type 2 diabetes and kidney problems. Both illnesses that can be caused by Agent Orange exposure. • 2006: The Australian government authorizes benefits for their Blue Water Navy veterans from Vietnam War. • 2006: Represented by the National Veterans Legal Services Programs, Haas wins his case at the Court of Appeals for Veterans Claims. The court’s ruling would have required VA to process all Blue Water veterans’ claims as if they were presumed to have been exposed to Agent Orange. The VA ultimately wins a temporary stay of the Court of Appeals for Veterans Claims ruling and appeals to the U.S. Supreme Court. • 2007: The George W. Bush Administration requests introduction of legislation to eliminate all Blue Water veterans from qualifying for presumptive exposure to Agent Orange. Bush’s Agent Orange exclusion legislation is introduced, but dies in Congress. • 2008: The Institute of Medicine, an arm of the U.S. National Academies of Science confirms the Royal Australian Navy finding that distilling seawater for drinking water increases dioxin concentration. The VA responds by saying more study is needed. • May 2008: U.S. Court of Appeals for the Federal Circuit overturns the 2006 Court of Appeals for Veterans Claims ruling in favor of Hass, saying the VA had the right to change its rules for Agent Orange eligibility and exclude Navy and Marine personnel who served on ships off the coast of Vietnam but cannot prove they set foot on land in Vietnam. • Oct-Nov 2008: The National Veterans Legal Services Program appeals the Circuit Court decision in the Hass case to the U.S. Supreme Court. The American Legion and other groups file briefs in support of Commander Hass’ case. • January 2009: The U.S. Supreme Court refuses to hear the Hass case, effectively upholding the VA’s right to exclude Blue Water veterans. The VA rejects pending claims of Blue Water Veterans without proof of boots on ground. • May 2009: U.S. Rep. Bob Filner introduces HR-2254. Companion legislation introduced in Senate. • December 2009: The VA asks the Institute of Medicine to conduct another study of whether distilling Agent Orange tainted seawater increases dioxin concentrations. Results are due the summer of 2011. • May 2010: U.S. House of Representatives Veterans Affairs Committee holds hearing on the Agent Orange Equity Act. Congress fails to act on the measure and the legislation dies. • September 2010: U.S. Senate Veterans Affairs Committee holds a hearing on the cost of adding ischemic heart disease, hairy cell leukemia and Parkinson’s disease to the list of illnesses presumed to be connected to Agent Orange exposure. U.S. Sen. Jim Webb, D-Va., who served with the Marine Corps in Vietnam, voices skepticism of such Agent Orange compensation. • March 2011: U.S. Rep. Bob Filner, D-Calif., re-introduces the Agent Orange Equity Act, H.R. 512, to restore benefits to all Vietnam veterans exposed to the toxic herbicide. This entry was posted in Uncategorized and tagged Agent Orange, Agent Orange Act, Blue Water Veterans, chlorachne, Jonathan Hass, Ken Olsen, Operation Ranch Hand, Royal Australian Navy, The American Legion Magazine, Vietnam Experience Study, Vietnam veterans. Bookmark the permalink.